Chef Paul Kirk, the Kansas City Barron of Barbecue and frequent instruction of Lang BBQ Smokers’ Q-School – Congratulations! Congratulations on your induction into the American Royal BBQ Hall of Fame 2015! Chef Paul Kirk was nominated by Carolyn Wells, the Queen Mother of ‘Que and the co-founder of the Kansas City Barbeque Society (KCBS). 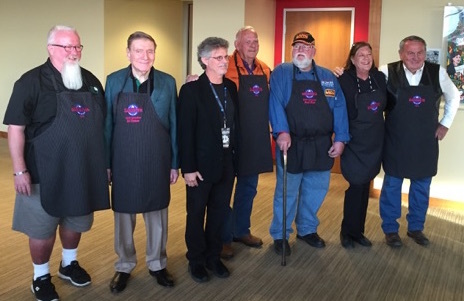 The BBQ Hall of Fame induction ceremony was held at the 36th Annual American Royal World Series of Barbecue. The 2015 Barbecue Hall of Fame inductees are: Ed Fisher, Steven Raichlen, and Paul Kirk. The team at Lang BBQ Smokers extends our heartfelt congratulations! We were so proud to see you wearing our Lang BBQ Smokers cap. And we are thrilled that you will be instructing yet another Q-School this November on our smoker cookers! He asked – Can you build a rotisserie in my smoker cooker?